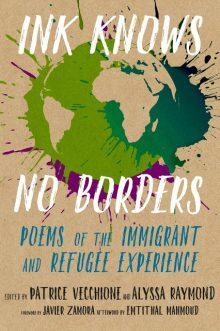 Celebrate the launch of Ink Knows No Borders: Poems of the Immigrant and Refugee Experience. This new collection of poems focuses on the experiences of first- and second-generation immigrants and refugees. Published by Seven Stories Press. Edited by Patrice Vecchione and Alyssa Raymond. To begin the evening, poets JoAnn Balingit and Elizabeth Acevedo will read from their own work, then share inspiring poems they have chosen from the anthology. After the readings, editor Patrice Vecchione will moderate a conversation with the poets and the audience. Please come share your questions and experiences of immigration and migration. I’m looking forward to reading poems for this contest! I’ll serve as poetry juror for The 45th annual Westmoreland Arts and Heritage Festival Poetry and Short Story Contest. If you’re interested (I hope so!) mark you calendar. Submissions are open through January 18, 2019 (postmark deadline). Winners in both poetry and short story categories receive a Westmoreland Award: $200 plus an invitation to read their works onstage. Cash prizes and stage invitations go to 1st, 2nd and 3rd place poems and stories too. The Westmoreland Arts and Heritage Festival takes place July 4, 5, 6, & 7, 2019, with performing arts, diverse cultural events, foods from many traditions, fine arts, music and crafts. Latrobe, location of the festival site, is southwest of Pittsburgh, Pennsylvania. Here’s more information & a link to download an entry form. It’s the new year, so start sending out your poems! Celebrate the publication of Abigail and The Underground Railroad! Students in grades 6 through 9 wrote and illustrated this hardcover book. 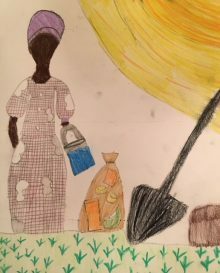 During our 8-week Young Writers Workshop at the Hockessin Library, students created the story of Abigail, a slave, and Jacob, a slave owner’s son. The fictional story includes poems by participants, as prologue and epilogue. Students also collaborated on illustrations. The events and characters are based on history. We read about underground railroad activity and conductors in northern Delaware. Guest speakers visited our workshops. The celebration and book launch will be held at Hockessin Library, Monday, October 29, 2018 at 6:30 pm. Open to the public. Sponsored by New Castle County Libraries. October is Filipino American History Month (FAHM). Come celebrate with me at the Newark Free Library. To honor the culture of the Philippine Islands, Newark Free Library is hosting a Parol Making Workshop. Participants will assemble and decorate a festive paper lantern or Parol. 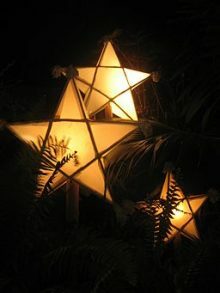 These ornamental star-shaped lanterns are symbols of Filipino yuletide tradition. I will share poetry, we’ll listen to some Filipino folk music, and you can also take a look at the ancient script of the Philippines–Baybayin. Participants can practice drawing letters in Baybayin. We provide all materials and tools to make and decorate your parol at this workshop. Light refreshments will be served. This workshop is free and open to everyone. “Letters and Lanterns” is part of the ALA Talk Story program, funded by the Asian/Pacific Library Association and the American Indian Library Association. Please call (302) 731-7550 to register. All are invited to attend. Connect with contributors to Imazine 2017. This is the 7th annual volume of New Castle County Libraries annual creative writing and art magazine for teens. Learn about publication opportunities, enjoy light refreshments, hear this year’s contributors tell what inspired their pieces. Submissions for IMAZINE 2018 now open to Delaware teens! Submit by 11/30/18. by The Twin Poets, Delaware’s Poets Laureates; & reading by JoAnn Balingit, state coordinator of Poetry Out Loud. Sponsored by New Castle County Libraries and the Claymont Library. In a round-table discussion based on audience questions and comments, we’ll talk about how poets and writers can build community and meet local needs. This workshop will encourage students to experiment with forms, lists, journal entries, evocative lines, and model poems to generate a poem a week. We’ll get into a writing rhythm and talk about what makes a poem work. Students will bring copies of their poems to share each week. TO REGISTER: Call us at 302-266-7266 or visit during regular hours. Sign up in person at the Newark Arts Alliance during regular business hours. Checks cashed/credit cards processed only if class runs. Registration payments are non-refundable except in case of class cancellation. 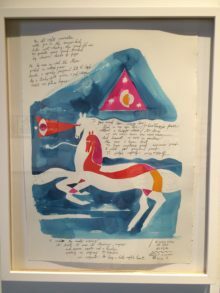 This workshop will encourage students to experiment with forms, lists, journal entries, evocative lines, and model poems to generate a poem a week. We’ll get into a writing rhythm and talk about what makes a poem amazing. Students will bring copies of their poems to share each week. RESIST MUCH/OBEY LITTLE: Poems to the Resistance, Dispatch Editions 2017. 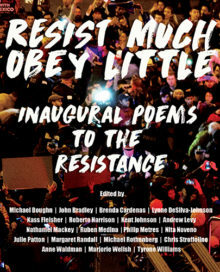 “This anthology represents a model for activism and mobility in a time of political emergency.” –Review by Dante Di Stefano, Resist Much / Obey Little at Best American Poetry. 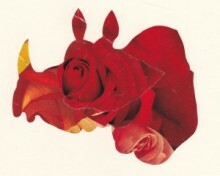 for RHINO’s annual Founder’s Prize and will appear in the new issue in April. Congratulations to Greg Grummer, winner of the 2016 Founder’s Prize for “The Great Butterfly Collapse” and to Runners-Up Katie Hartsock and Teresa Dzieglewicz! It’s cool that my friend Maggie Rowe from Newark also has a poem in this issue–Newark, Delaware poets on the march! Her poem and mine are among the ten finalists. 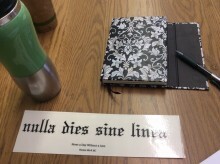 But hers has the more intriguing title, “Like a Solemn Friend Inebriate with Rain.” Can’t wait to read it. “Limón Homage” is dedicated to Sema Mellian, a wonderful woman and painter whose parents survived the Armenian genocide, and who painted the still life that inspired this poem. My friend Sema passed away in September. Thanks to Angela Narcisso Torres, Ralph Hamilton and the RHINO editors. On October 11, I will be “In the Company of Laureates,” hosted by the Poetry Society of Virginia and Write by the Rails, the Prince William Chapter of the Virginia Writers Club. I’ll be there to offer poems and ideas as part of a panel on “Inspiration and Experimentation” with Virginia poets laureate emeritae, Carolyn Kreiter-Fronda and Sophia Starnes; and Prince William Poet Laureate Zan Hailey. More than 20 current and former Poets Laureate from Delaware, Maryland, Kentucky, Virginia and West Virginia will celebrate American poetry. 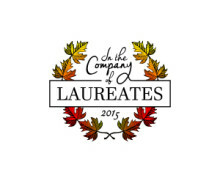 In the Company of Laureates takes place from 1 p.m. – 5 p.m. on October 11 at the Hylton Performing Arts Center on George Mason University’s Science and Technology Campus in Manassas. Poets and poetry enthusiasts are invited to join us for workshops, panel discussions, open mics and more. There will be programs and activities for teens throughout the event.